Harriet helps Dieter pack for the trip to Tergistan - but this is far from a holiday. Dieter doesn't take too kindly to being pushed around by the survival training expert. Max isn't happy with Hoff's son Dieter after presenting his father with a Hitler speech. Much to the annoyance of Max, Terry educates The Hoff on outlandish conspiracy theories. Join us as The Hoff's new driver Terry gives us a tour around his beloved minicab. 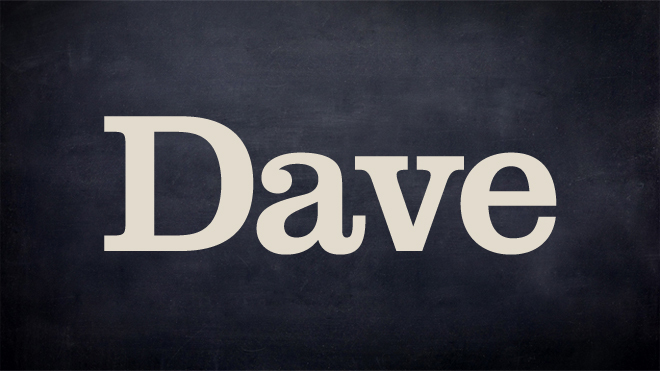 Meet the stars of Dave, from Alexander Armstrong to somebody near the end of the alphabet. The car's the star - but don't let Jezza and co. here you say that. A decade after the end of Series VIII, Red Dwarf returned to screens in the UK - on Dave! With Back to Earth a big success, a full series was commissioned. Video clips from Dave's most unusual gameshow, starring the one and only Pub Landlord. Clips from the panel show presented by the Pointless host. Video clips from the chat show with a difference. Get in the hot seat for the driving show for petrol heads. Become a legal eagle with clips from all the episodes so far. From top ten stars in reasonably priced cars to top ten controversies, read all about it. Meet the crew of the Dwarf - from series one to the tenth run. Meet the gang who populate the good ship Red Dwarf and beyond. Read all about the series that put the sitcom into space. Get your mitts on a whole swag of goodies, if you're lucky enough to win one of our comps. Dave answers some fascinating questions from the audience of Modern Life is Goodish. See what Dave has to offer in terms of Motoring. Alex Horne's Podcast, the least topical 'topical' podcast. Try Dara's fiendishly tough and infuriatingly tricky maths puzzles. In theory logic is as simple as it gets. In practice it can be a complete nightmare. 3 is the magic number... maybe not for any of these puzzles... probably for others though. Get yourself in shape by taking on a strenuous selection of mathematical mindbenders. Andrew sits down with his fellow Irish funnyman to find out what makes him tick. Five pairs of celebrities. Five unique locations. One mission. A rundown of the plucky personalities. 10 things you didn't know about the 24 Hours countries. Gorge yourself on Dave's lovely podcasts. Jimmy Bullard, Rob Beckett and Ian Smith present the chart-topping football podcast. Anyone for elevenses? Yes, oh yes, Red Dwarf is back on Dave for another series. What was it like to work with legends like Rutger Hauer and Kelsey Grammer? From demon hunter in Crazyhead to bossy porter Frankie in our brand new comedy. Claudia Jessie plays naive nurse Lucy, Simon's would-be love interest in Porters. What's legendary movie star Rutger Hauer doing in a British sitcom? We found out. Jo plays Dr Kelly, the face of the overstretched, undervalued NHS in Porters. The brains behind Porters has crafted his comedy from real life experience. New Go 8 Bit and Go 8 Bit DLC are coming to Dave, starting 15th May at 10pm. Critically-acclaimed series Alan Davies: As Yet Untitled is back for a fifth series. Darren Walsh wins our eighth annual ‘Funniest Joke of The Fringe’ award in Edinburgh. He's a frantic comedy warlock who can magic up entire stand-up skits out of thin air. So who'll be settling down in the Crackanory chair to spin some weird and witty yarns...? Unlike practically every other panel game show, HIGNFY has managed to stay fresh. Here's a guide to the stars of our favourite, ahem, reality show. Stephen Fry stands tall in the great hall of Dave like a titan of trivia, thanks to QI. Meet Jonny Smith from the Lazy Boy Garage team - our new show on Dave. See what the cast are looking forward to in this brand new series of Porters. Brace yourself for extreme eating with Adam Richman - no dish is too much. He's a stand-up, presenter, comic and has a terrific first name, don't you think? The show were guests dissect, satirise, lampoon and generally warp the affairs of the day. Who says sharing a flat is easy? Especially when your landlady is the woman you fancy. There's plenty of ways to get Dave in your life. All about Dave On Demand and a handy troubleshooting guide. Jeremy Clarkson, James May and Richard Hammond with the car show that manages to be more. Learn more about Breaks the News, Tv channel Dave's award-winning podcast. Meet Brandon and his wife Lori, the fiercest competitors in a high-stakes sales game. What's all this about Charlie Higson once being Britain's foremost funk-punk vocalist? Stand by for an adrenaline sport the likes of which you have never seen before. These days, more people seem to know Kevin Eldon by name as well as face. The boys from the Dwarf return in a brand new series. Specialises in amusing panic attacks, hilarious dread and rib-tickling nervous breakdowns. Welcome to the bush flyers, who work away from the comforts commercial pilots enjoy. Sarah Solemani became famous by lying about in bed, farting occasionally. Series charting the regular humiliations of film extra Andy Millman and his friend Maggie. A few smirks at Alan Partridge's expense was all it took to catapult Sally to fame. Franks Skinner’s Opinionated is a topical comedy show that discusses issues in the news. She co-wrote the most accurate ever sitcom about being single in your 30s. We've been fervent fans of the man ever since he played Guy Secretan on Green Wing. All about the chat show with a difference featuring star turns and, of course, Rob Brydon. One of the witty wordsmiths behind Crackanory, we had a good natter with Holly Walsh. The boys take a trip to the home of pasties, clotted cream and Rory McGrath; Cornwall. He's written for chuckle-merchants like Jimmy Carr, Jason Manford & Armstrong and Miller. The ultimate physical challenge series in which contestants with balls go head-to-head. Not a crisis in sight - but plenty of 'suburban issues' to worry about! Meet Nelson, Vince, Kali and Destiny, the potty-mouthed puppets who are just like us. Meet the estate agents that are so tough - they buy houses without seeing them first! He may look like a jolly local butcher, but Ray Mears is basically a real-life Rambo. Here's a list of the lucky few. It's not a long list so they are VERY lucky.